A mining accident: a methane buildup (the monitors had been turned off), a spark (an unfixed problem) and an explosion (29 men dead, 24 bodies recovered). Jeremiah Munsey's May the Lord Take a Liken To You, directed by Julie Ouellette for North By South Theatre Los Angeles, tells the story of the widows of the five men whose bodies and souls remain in the cave. Powerful and poignant, acted like uncoiling springs, the production deals with matters spiritual in complex, ambiguous ways. It poses a very interesting dilemma, described by lyrics to a Dire Straits song, "Two men say they're Jesus one of them must be wrong." The widows, Sarah (Sarah French), Florence (Chera Holland), Lorna (Marissa Hampton), Letha (Megan Combes) and Cat (Nicole J. Adelman) stage an Occupy protest in an abandoned coalmine in Randolph County, West Virginia, the site of the disaster. Cat has had a vivid dream about the souls of the men that remain trapped in the cave. 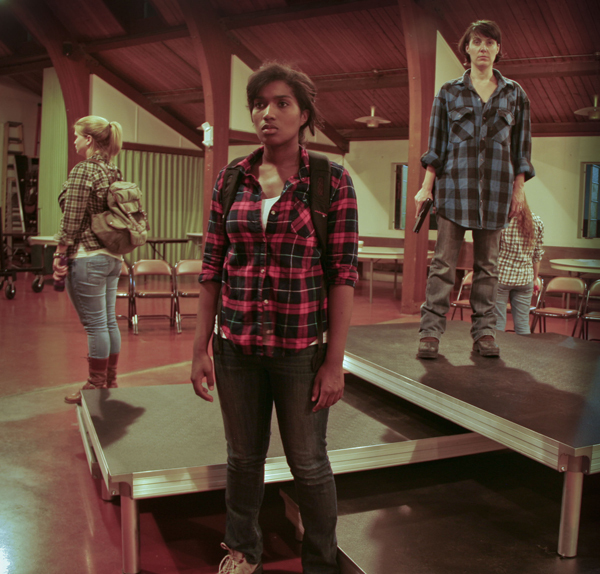 A natural leader, she's inadvertently charismatic, in a flannel shirt and work boots way. She demands a face-to-face apology from the mine's owner, McElroy (Guy Mack). He won't comply. Legions of trigger-happy company stooges and police officers mount outside the cave. The resolution is not pretty, and it's certainly not clear-cut. And we're left wondering, which is the aggrieved party? Adelman's Cat is a catalyst, the sort of spark that caused the tragedy in the first place. It can be argued that her spark caused the second tragedy as well. She emits conviction, first, in her voice and stature, and later, when she finally meets McElroy, in her trembly courage. It's clear that she hadn't fully thought through what she would do when she met her foe. And she's no saint, either. She broke into his office and stole a gun. More significant, she stole something of great personal value, a symbol from when, decades before, he had a near-death experience, the survival from which made him think he was no mere mortal. The set up of the first meeting between Cat and McElroy was stupendous. The fire and brimstone Cat, the meek-but lethal McElroy who, with his black hat, makes you think of "Breaking Bad's" Walter White and, with his quiet ways, of the show's Gus Fring. It's clear they both operated from the sort of inspiration that would mean that there could be no winners. And there weren't, no way, no how. May the Lord Take a Liken To You describes a story of martyrs to causes, of following leaders because they're charismatic but whose motives, upon closer inspection, are not pristine. You feel for the women throughout the course of the production. As the story progresses, though, you realize that Cat's doing this for reasons far beyond the simple though tragic loss of a husband. This is confirmed when she gets her face-to-face and still refuses to back down. Adelman nails this ambiguity. We feel sorry for her, we admire her, and then we wonder whether she's really got the interests of her co-widows (and the souls of their husbands) at heart. By the end, in the dramatic flameout, we don't know what to think. Similarly with Mack's McElroy. We despise him as we would a melodrama villain. He's greedy, he's a megalomaniac, and, quoting Joseph Kennedy, he believes that only the strong (read: survivors) should rule the world. As we reassess Cat, so too do we reassess McElroy. He also had a defining experience, years before, one that turned him from a regular guy, a local boy made good, into a Machiavellian monster. By the end, we don't know who to trust, whom to root for. At that point, though, it doesn't matter. The final performance is tonight, Saturday, 8pm, October 12th. Tickets are $10. The Theatre is located at the Parish Church of St. Mark, 1020 N. Brand Boulevard, Glendale, CA 91202. For more information on North by South Theatre, visit www.northbysouththeatrela.org.